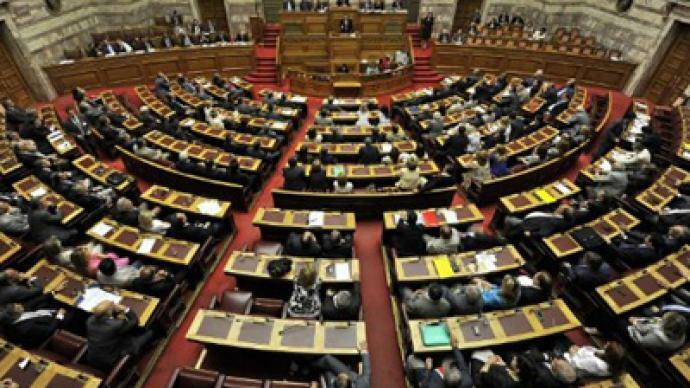 The Greek Parliament has won a crucial confidence vote, 155 for and 143 against, allowing it to proceed with savage new austerity cuts needed for another EU and IMF bailout loan. 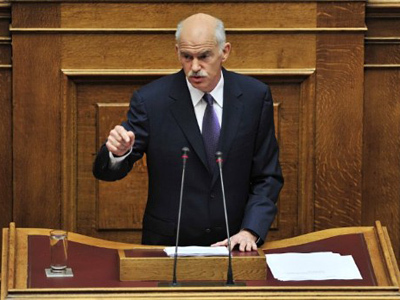 ­Prime Minister George Papandreou's new Cabinet was approved by a majority of the 300-member legislature on a pledge to pass deeply disliked austerity measures that have provoked strikes and mass protests. The new finance minister, Evangelos Venizelos, will now seek to push through harsh austerity measures against fierce public opposition, in return for another EU/IMF bailout to prevent the country from defaulting on its loans. Next week Parliament is expected to vote on a slate of measures that includes tax hikes, 28 billion euros of budget cuts and 50 billion euro worth of privatization of public assets. The plan is expected to be voted on by the end of the month and is a precondition for Greece to receive further aid from its international creditors. Earlier thousands of people gathered outside the Parliament building in Athens to protest against both the austerity measures and the government in general. Papandreou reshuffled his Cabinet and replaced his finance minister last week after weeks of demonstrations against his handling of the crisis. 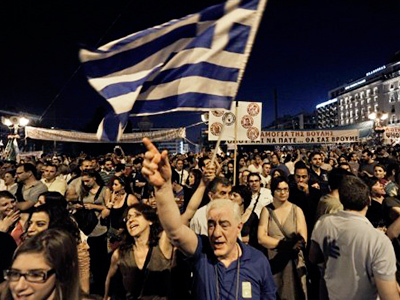 It comes as the country stands on the brink of becoming the first eurozone nation to default on its debts. European finance ministers have given Athens two weeks to force through tax hikes and spending cuts, as fears mount about the future of the euro itself should Greece default. Billions of euros in austerity measures are vital to secure a second EU bailout, a lifeline for Greece's paralyzed economy. But there is an ever-widening divide between the government's vision, and the will of the people. The country is considered by many to be the birthplace of democracy, but the growing gap between the aims of the people and the government in Greece is now proving explosive, sending thousands onto the streets to protest against the decline of living standards. Demonstrations are held on the central square of Athens on a daily basis now, with some of the protests turning violent. But protestors say the suffocating tear gas is nothing compared to the austerity measures they feel are strangling their economy. “We are not anymore in the proper sense a sovereign country. When the IMF can dictate policies, when the ECB and the EU and the IMF, the so-called Troika can come and say, ‘listen, these are the measures you are going to implement whether you want them or not’, we can say in a way we are facing a very peculiar form of dictatorship by the EU, the European Central Bank and the IMF,” he concludes. Euro finance chiefs are desperate not to see the first eurozone sovereign default, and there are rising concerns about the crisis that could trigger further problems throughout Europe. But with 16 per cent of the Greek workforce unemployed and worsening economic conditions, it seems the eurozone dream for Greece is over. “If the government won’t listen to the people’s voice, Athens will be full of people, there will be an uprising and there will be a lot of violence on the streets,” Pavlopoulos promises. The people in Greece have said that they are turning out onto the streets in their millions and the government continues to push ahead with the proposed measures, then they no longer have democracy. “The government is trying to govern but the people refuse to be governed in this way,” shares Panagiotis Sotiris. Every day that disconnect becomes more and more dangerous. 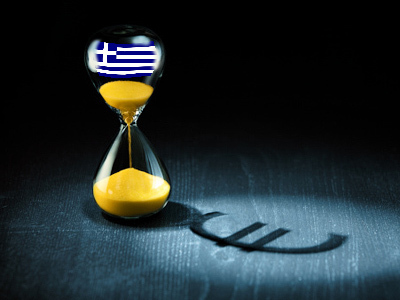 Many have been asking just when will Greece reach boiling point? But anyone on the streets witnessing the violence will know that it has already passed that point. The question a lot of people are now asking is just how much further will this go?